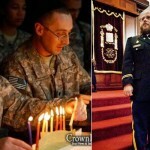 By most measures, Yisroel Newman, 25, and other young Chabad-Lubavitch rabbis like him are the obvious solution to the army’s severe shortage of Jewish chaplains. These young rabbis are trained by a movement dedicated to reaching Jews wherever they may be, no matter how remote. The peripatetic military lifestyle would not be much more difficult than the postings that some recently ordained young Chabad rabbis have received in Siberia, with no more than a few thousand dollars to start a Jewish community. 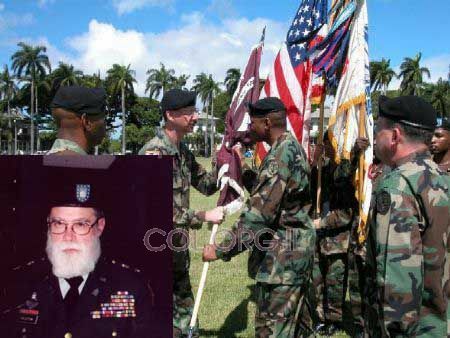 Newman had a chance to try out the military in 2002, when he served as a part-time chaplain at the army base in Fort Knox, Ky. Army life seemed a good fit; he led services and organized raucous Hanukkah and Purim parties. Things were going so well, the chief chaplain on the base encouraged Newman to enlist in the army. Only one problem — his beard. Army regulation 670-1 is clear: “Beards are not authorized” and “exceptions or accommodations based on religious practice will not be granted.” The other branches of the armed services have similar regulations. On the Chabad side, the rules seem equally clear. In Responsa 93, a commentary on the Yoreh De’ah legal code, the third Lubavitcher rebbe ruled that shaving a beard is against Halacha, or Jewish law. In Leviticus, it is forbidden to shave with a razor. Most Orthodox Jews have worked around this by shaving with scissors or an electric razor, but the Rebbe, who was known as the Tzemach Tzedek,said that any means of removing hair from a man’s face is forbidden. Period. The generals, citing safety concerns, seem as inflexible as the rabbis when it comes to the issue of beards, even though there is no question that the army, with only 29 active duty chaplains, could use a few good Chabadniks. The Jewish chaplain shortage is so acute that the task of finding new rabbis has fallen to the critical shortage chaplain recruiter. For the military, the topic of beards is sensitive, given the potential for accusations of religious discrimination. Military spokesmen are quick to point out that beards are prohibited because they interfere with gas masks. Other ultra-Orthodox Jewish movements also follow the proscription on shaving, but few would be as interested in military positions as Chabad members — who have become famous for their willingness to endure hardship so that they can reach underserved Jewish communities. Orthodox Jewish chaplains said the military is very accommodating in most matters. Yarmulkes can be worn, and chaplains are able to observe Jewish holidays fully. But on the beard front, the army has kept up the gate, and done so despite evidence that bearded men can, in fact, wear gas masks. In Israel, Chabad rabbis are a regular part of the chaplaincy and military forces — and all of them must be capable of donning gas masks. Perhaps more significantly, in America today there is one bearded Chabad-Lubavitch rabbi in the military: Jacob Goldstein, who works with the command staff of the First U.S. Army. “I’m a Lubavticher boy, lock, stock and barrel,” Goldstein said as he sat in an office decorated with pictures and keepsakes from his 28 years of service. Goldstein’s length of service explains why he has managed to keep his beard. When he joined the New York Army National Guard in 1977, a member of the air force had just sued over religious accommodation and, Goldstein said, the military was feeling skittish about discrimination issues. There were already a few Sikh chaplains who had been allowed in with their beards. Then the army tightened up. Goldstein and the Sikhs were grandfathered in by army regulation 600-20, which allows men who joined the service before 1986 to keep beards with which they entered. But Goldstein, 58, never has been the active duty chaplain that the military needs most. He works a day job at the New York State Division of Housing. Still, his beard has seen its share of action each time he has been called on for overseas duty. He was the only Jewish chaplain in Grenada in 1983. More recently, in 2003, he was in Iraq for two months and helped set up a sukkah in Saddam Hussein’s palace. And Goldstein said that during all his assignments, he has had a gas mask that fit him snugly. Before he went off for the first Gulf War for seven months, Goldstein had to demonstrate that he could put on the mask in eight seconds, like the other soldiers at Fort Dix, and he did so without a problem. “The mask issue is bogus,” Goldstein said, before speculating that the larger reason for the rule is the military’s desire for uniformity in appearance. 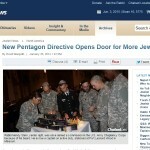 Goldstein said that part of the problem is the Jewish Welfare Board Jewish Chaplains Council, which is responsible for endorsing Jewish chaplains, has not been eager to push the issue with the military. 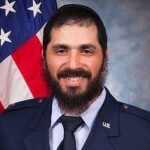 There is one other Chabad rabbi in the military today, who enlisted after a rabbi granted him special permission — known as a heter — to shave his beard so that he could join the military. However, a number of Chabad rabbis said that for the majority of Lubavitchers, beards are as nonnegotiable as eating kosher food. “When I was given the choice of beard or army, I said I’ll walk,” Goldstein said. There is a move underfoot to change things. The Aleph Institute, a Chabad body that works on chaplain issues in prisons, is applying to become a second endorsing body for Jewish military chaplains. The institute is donating a Torah scroll to the Pentagon in September, and the institute’s director, Mendy Katz, said he hopes that will give him a chance to push the issue with Secretary of Defense Donald Rumsfeld. An official in Rumsfeld’s office said that members of the Pentagon’s civilian brass would not be the ones to change the rule, adding that any entreaties should be directed to the chief of staff within each of the military’s branches. Even if the rule is changed, the chaplaincy would not be easy for most Chabad rabbis. Goldstein said that the toughest part for most young Chabad rabbis would be adjusting to life in a non-Jewish world and ministering equally to non-Jewish soldiers. Most Chabad rabbis are raised in Jewish enclaves where interaction with non-Jews is limited. But Goldstein said that his work never has required him to break any Jewish law. For example, he noted, the prohibition against shaking hands with women is not an issue because saluting is the way introductions are made in the military. Still, interest certainly appears to exist. Goldstein said that at least half a dozen young Chabad men have come to talk with him about his work since the war in Iraq began. Newman has talked to a number of his friends, who he said are interested. The chief chaplain at the base in Kentucky where Newman had worked said he hopes something can be worked out. im having the same exact problem with the Fire Dept. of New York (FDNY). im an Emergency Medical Technician and i am trying to get a job with FDNY so i can work on their ambulance. they wont take me, however, because of my beard. Rabbi colonel Goldstien is helping me so far.